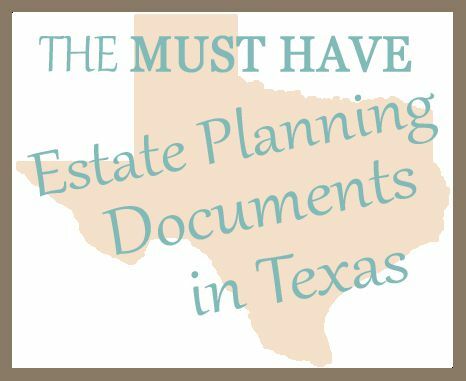 6 Estate Planning Documents Every Texan Should Consider | The Ashmore Law Firm, P.C. No one wants to think about death, especially not their own. However, estate planning is not something to be procrastinated. Estate planning allows you to protect yourself and your family if the unthinkable happens. With proper estate planning, you can ensure that your loved ones are cared for according to your wishes. Even if you have no children, a will allows you to choose who receives your possessions. Without a will, the state makes these decisions on your behalf. Estate planning is also about protecting your rights if you are ever unable to make decisions for yourself. This is why everyone over the age of eighteen, regardless of income, should consider the following documents. 1. A Will: A will (or last will and testament) names an executor who will manage your estate and make sure that the wishes expressed in your will are followed after your death. The will states who you would like to receive your personal belongings and assets. If you have any dependents, it is very important that you have a will. A will appoints a guardian for your minor children. 3. Medical Power of Attorney: A medical power of attorney grants another person the legal authority to make medical decisions if you are unable to do so. It is a good idea to discuss your beliefs and wishes with this person so you can be sure they understand your wishes. 4. Advance Directive to Physicians or Living Will: This document protects your choices should you become terminally ill or suffer from an irreversible medical condition. It allows you to express your wishes regarding continued health care and life saving or life-extending measures. 5. HIPPA Authorization Form: This document authorizes medical care providers such as doctors and hospitals to release your medical records to individuals that you specifically name. 6. Designation of Guardian: A designation of guardian permits you to appoint a guardian for yourself or to prohibit anyone who you would not like as a guardian from taking that role should the need ever arise. Because we believe that estate planning is important for everyone, we have written a free book, Do I Really Need a Will? that will help you learn more about the estate planning process.